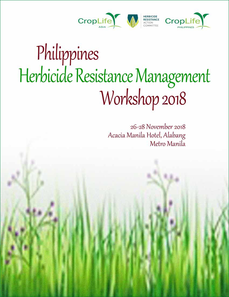 CropLife Philippines is all set to conduct the Philippine Herbicide Resistance Management Workshop at the Acacia Manila Hotel in Alabang from November 26-28, 2018. The event seeks to encourage attendees to understand herbicide resistance issues across the country and share ideas and practices on herbicide resistance management to benefit other participants. Through the activities scheduled for the event, CropLife seeks to create a concrete action plan that is aligned with the thrusts of CropLife International on policy development, mode of action codes for product labels, and the implementation of resistance management for small stakeholders. The workshop also seeks to capacitate farmers on monitoring herbicide resistance in their farms. Among the expected participants of the program are APWSS, government officials, scientists, rice and corn farmers, banana and pineapple growers, stakeholders from the local pesticide industry, PH RAC & Asia HRAC and members of CropLife Philippines.